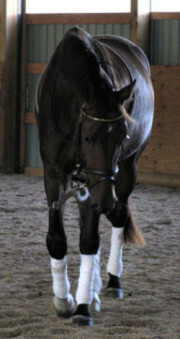 After Hours (aka “Angel”) was officially inducted into the mare band in 2009 with her acceptance into the Hanoverian Main Studbook, joining her mother, SPS Ester, and her half-sister, Contessa by Contendro. At her inspection Angel scored 7.17 overall, including 8s for her Head, Forelegs, and Correctness of Gaits. Angel is a long-legged, rectangular shaped filly with lots of swing and cadence in her movement, and a lively feminine grace. She stands 16.1 1/2h, has a lovely aura, and is easy to handle and easy to love, with a hearty constitution, and a confident demeanor. 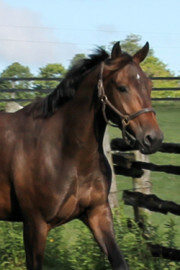 After Hours produced 3 outstanding babes for SunnyDays Hanoverians (by Belissimo and Romanov), and has now moved to a new home in Ontario where I am sure she will give Heather many more beautiful foals.